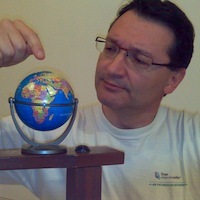 Pietro Zanarini is the director of the Information Society sector at CRS4. His current activities focus on launching new CRS4 initiatives to help further the growth of Sardinia in the Information Society. He holds a degree in Physics from the University of Bologna (1982). Before joining CRS4, he worked for 9 years at CERN, the European Organization for Nuclear Research in Geneva (... where the web was born! ), developing some of the major CERN Software Application Packages (GEANT3, PAW, KUIP). He came to Sardinia in 1991 as the first employee of CRS4, helping the founding CEO to set-up the Centre from scratch. In 1993 he co-launched "L'Unione Sarda On-Line" project, one of the first on-line newspapers available on Internet/WWW, that originated the Video On Line Internet Service Provider and, with the later advent of Tiscali, de-facto started a process of transformation of Sardinia in one of the Internet key players. Later he launched the "DistrICT", a multi-lab facility to develop advanced prototypes of possible "future" applications of state-of-the-art technologies, aiming at catalyzing innovation in current companies of Sardinia, attracting and stimulating collaborations with outside companies, faciliting the birth of spin-off and start-up companies in the ICT-Information Society. Some of the topics of this multi-lab are: Natural Interaction Technologies, Open Media-Center, Digital Media Applications, Collaborative production of multi-platform TV programs and new TV formats for digital contents, Location and Sensor Based Services, GeoWeb and Mobile Applications.